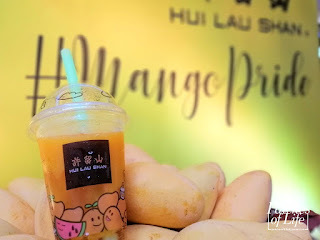 Hui Lau Shan: First Flagship Store in the Philippines Opens this March 2019 in SM Megamall! Home / Bistro Group / Food / Greenhills / Krazy Garlik / Main / San Juan / Krazy Garlik: New Branch in Greenhills and New Dishes -- Kraaazy Grubs! Krazy Garlik: New Branch in Greenhills and New Dishes -- Kraaazy Grubs! A big HOOORAYY to Krazy Garlik's newest branch at 2nd Level, New Wing, Promenade, Greenhills! This is their fourth branch after Greenbelt 5, Resorts World, and Alabang Town Center. Very strategic locations. Unlike the other branches, this new home in Greenhills has a bit more sophisticated ambiance yet still captures a playful "Alice in Garlic Land" idea. Lively colors of red, yellow, and blue, highlighted with the "garlic" ceiling lights which I really love! Time to eat! I've been to a few Bistro Group restaurants, but so far, Krazy Garlik is my favorite. They don't really have a specific country cuisine but it's more of a fusion of Asian flavors with garlic as the key ingredient. After enduring a heavy traffic going to Greenhills, the first thing I had in mind was that: "I want a refreshing drink!". The Half Liter Honey Dew with Popping Bobba did not disappoint me. It even became my instant favorite drink at Krazy Garlik. It may have been the simplest fruity drink among the Drink Me line up, but the lychee-like popping bobba that bursts in your mouth gives the thrill. For milk tea lovers, Thai Tea is recommended. Despite the creamy-chilly texture, even made more interesting by the jelly and popping bobba, the tea kick was never compromised. This Spinach and Cream appetizer was addicting. The first time I've tried this with a group of friends, it was an easy decision to order another set as we just can't get enough. Spinach and cream dipped in salsa -- very simple and I don't even know where the garlic is for this dish. But I just know that this will be a main stay in my order list whenever I dine at Krazy Garlik. It may appear to be really spicy, but hold your horses 'cause it's not. I barely felt the chili as its ingredient. Probably the coconut cream sauce overpowered it? Actually, I even find it a good thing as my stomach condition can no longer bare spicy food. So for me, this Stuffed Pechay is a thumbs up! The Amazing Krazy Garlik Salad is an all-time favorite among the customers. Even I, who isn't really a fan of salad, really enjoy this. Was it the shredded leaves? the chicken strips? the dressing and peanut sauce? What I can say is that the combination of all the ingredients is perfect! When you think about garlic and pizza, this is the best thing that you can get -- Garlik Snowflakes. Thin crust, creamy-cheesy base, and oozing with flavor. Talk about spicy and I mean really spicy option for flavored rice. Hara-Kiri is loaded with interesting spices that would tickle your taste buds. It was quite challenging for me to eat this as it might trigger my acid reflux that I ended up ordering a plain rice. 40 Kloves Chicken is one of Krazy Garlik's Signature Dish. Once you've tasted it, you'll know why. What I love about Krazy Garlik is their flavorful and full of spice dishes. I love how the flavors linger in my palate. This dish encaptures that description. Add to that the crispy chicken skin and a matching gravy/sauce. Garlicky Crispy Pata is another house specialty and customer favorite! Crispy, savory, and I love how the sauce enhances the dish. Tuna Belly has simple yet defined flavor. What you'll be able to taste is a fresh grilled tuna, in its natural tuna goodness. Might be a bit greasy though. Sweet 16 Chicken is Krazy Garlik's version of chicken fillet in sweet and sour sauce. The number 16 here isn't really significant, nor it represents the number of ingredients or spices. It's just "Sweet 16". Garlic in a dessert is something I ain't sure if I can welcome. But Krazy Garlik definitely has a way to incorporate garlik in every dish, even in dessert. This Crepe Dynamite is a perfect example. The mango ice cream was creamy and delicious, while the rolled crepe with Nutella, nuts, and fruits was amazing. Still, it's the candied garlic that gave the bang and thrill in this sweet goodness. Krazy Garlik keeps on expanding their selections and has now come up with Kraaazy Grubs. It's a twist to the usual Mexican favorites like burritos, nachos, and tacos. Amazing Sisig Burritos can be shared by two as each slice is heavily stuffed with rice. To describe it, it's like rice topped with sisig, some lettuce and tomatoes, then rolled into a burrito. Krazy Braised Beef Tortilla Crusted Tacos is another heavy-for-one meal. More than the actual braised beef tacos, what I really loved was the garlic rice. Last but not the least is Krazy Garlic Nachos. This is good to be shared by 4-5 people, or even more if you're just having it as an appetizer. Though it has almost the same ingredients as a typical Mexican nachos, I still find that it lacks that "Mexican" oomp! But maybe this is Krazy Garlik's take on nachos. The beef and cheese sauce were good, though the nachos may tend to be oily. Whew! for a garlicky treat. Would definitely come back to my favorite Bistro Group restaurant.. so far! Patches of Life is my personal blog and in here, you'll find various read-ons from life thoughts to reviews & experiences in spas, travels, restaurants, and more. Know that everything I write here (sponsored/invites inclusive) is based on my honest unbiased view. If I love the service/food/experience, I will highlight it. But if there are things that do not match my liking, you'll see it here. Like you, I am also a consumer, a customer, or just someone trying out things. And here I am just sharing what I think hoping you'll find it helpful. So browse around and thank you for visiting! REVIEW: Holy King Medical Clinic: P149 Radio Frequency Slimming Treatment (P2500 Value) from Gupo! REVIEW: Lasema Spa and Sauna: P495 Sauna + Jimjil Bang + Massage (P990 Value) from Ensogo!